I have my maiden bite at these Korean icecreams at one of the exhibitions in Suntec City last Saturday, at just $1 each! 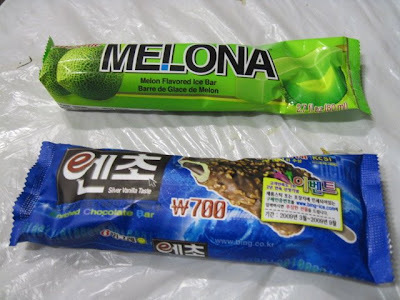 These icecreams are truly amazing..melon ice-creams are icecreams not really typical of Singapore icecreams right? While the chocolate ice-creams from Korea also have unique layers of different grades of chocolates. Me so kiamsiap also feel like trying already! ya it is very nice! Sentosa: I miss my monorail ! A Salute to the Unsung Heroes! The myth behind Ngee Ann City ! FREE ice cream along Orchard Road! Revamp of Singapore Short Stories! Singapore PC Show 2009.. what a madness!